STOP LEARNING AND START SPEAKING TURKISH WITH TURKISH SPEAKING LESSONS ONLINE VIA SKYPE, AT THE COMFORT OF YOUR HOME OR OFFICE, WHEREVER YOU ARE LOCATED IN THE WORLD! Turkish Coffee Break Casual Turkish speaking classes – For all levels. Turkish Speaking Practice Short Turkish speaking courses – For all levels. Let me give information about my Turkish speaking courses & classes with questions and answers. What is Turkish Coffee Break? Turkish Coffee Break speaking classes are ideal for Turkish language learners (any levels) who can’t find time to study and practice Turkish language but want to improve their Turkish speaking skill and gain fluency with short conversation classes (without any worksheets or lesson plans) through everyday conversations. Improve your Turkish with casual chats in Turkish while having a cup of coffee, any time of the day, before work, during your lunch or after work. Have a casual chat in Turkish with your Turkish language teacher online! I am not teaching, we are talking! This is the idea. However, I am always giving short grammar explanations and vocabulary when you need. Other than that, we are trying to talk and gain fluency. All you need is to have a cup of coffee (It doesn’t have to be a Turkish coffee, of course), have a small talk in Turkish with your Turkish teacher, practice what you have learned and improve your Turkish speaking skills. Talk about your day, what you did yesterday, what you are doing today, what you are going to do tomorrow, tell me about a film you saw, a book you read, gossip about friends… And ask a lot of questions! Are you using any materials during the class? I am a new beginner Turkish language student. Can I still take Turkish Coffee Break classes? Of course, you can. You don’t have to speak Turkish fluently. This is why we are having casual Turkish speaking classes, to improve your Turkish speaking skill even if you are an early beginner Turkish language learners. Take these casual classes and practice what you have studied. I am interested in Turkish Coffee Break. What are the details? How does it work? First contact me by email at info@demturkishcenter.com or aliakpinar@hotmail.com to schedule a short meeting onlinevia Skype (my Skype is dem.turkish.center) to have a short conversation in Turkish to get to know each other, discuss the details and schedule your classes. Then meet me online and start improving your Turkish speaking skill! I don’t want to take casual conversation classes. I need a proper course with a list of conversation topics to practice. Beside Turkish Coffee Break, casual Turkish speaking lessons online, I am also offering Turkish speaking practice courses, short Turkish speaking courses with a list of topics to practice. Turkish Speaking Practice courses are ideal for Turkish language learners who are taking a course or studyingthemselves and want to practice and improve their Turkish speaking skill through lists of of topics, dialogues and conversations in their levels. What’s the difference between Turkish Coffee Break and Turkish Speaking Practice Courses? The difference between the two courses is that you don’t have to follow a course program if you are taking Turkish Coffee Break classes whereas you are following a list of conversation topics (created by your teacher or you) during your course if you are taking Turkish Speaking Practice courses. Are you using Turkish language materials in Turkish Speaking Practice courses? Although we are not using materials in Turkish Speaking Practice courses, I will give you some worksheets for some topics & dialogues to study in class or after class as homework. Plus I will provide you with extra materials when you have a problem with a specific point that you need to study. Other than that, we are not using materials in the classes because our aim is to speak, have conversations and improve your Turkish speaking skill. Using materials in class may stop us speaking the language more than we need, I believe. I am intrested in this kind of Turkish speaking course. What are the details and how does it work? Contact me by email to meet online, discuss the details and chat in Turkish for a little to get to know you and have an idea about your Turkish. Plan your course with your Turkish teacher by making a list of the topics, points, dialogues etc you need to practice (or let your teacher plan it according to your level). Decide how many classes and what days and times to take classes. Schedule your Turkish Speaking Practice classes with your Turkish teacher. Thank you very much for your interest in my Turkish speaking classes & courses online. Please contact me by email at info@demturkishcenter.com or aliakpinar@hotmail.com to meet online to discuss and design your Turkish speaking classes or courses. I am Ali Akpınar, a qualified and experienced Turkish language teacher. Thank you very much for your interets in my Turkish language courses in Fethiye. Let me tell you about me a bit. I graduated from the English Teaching Department (the Marmara University in Istanbul) in 1998 and worked at various language schools in Istanbul as a non-native English language teacher and Turkish language teacher until 2004 when I started Dem Turkish Center, a Turkish language learning resource website offering Turkish language learning materials and online Turkish lessons. Since then, I have been creating Turkish Language Learning Books For Self-study – with/without audios, Turkish Lessons For Self-study – with audios & answer keys, Turkish Language Worksheets For Self-study – with audios & answer keys and offering Turkish Language Courses Online via Skype and face to face in Fethiye. I am originally from Istanbul. 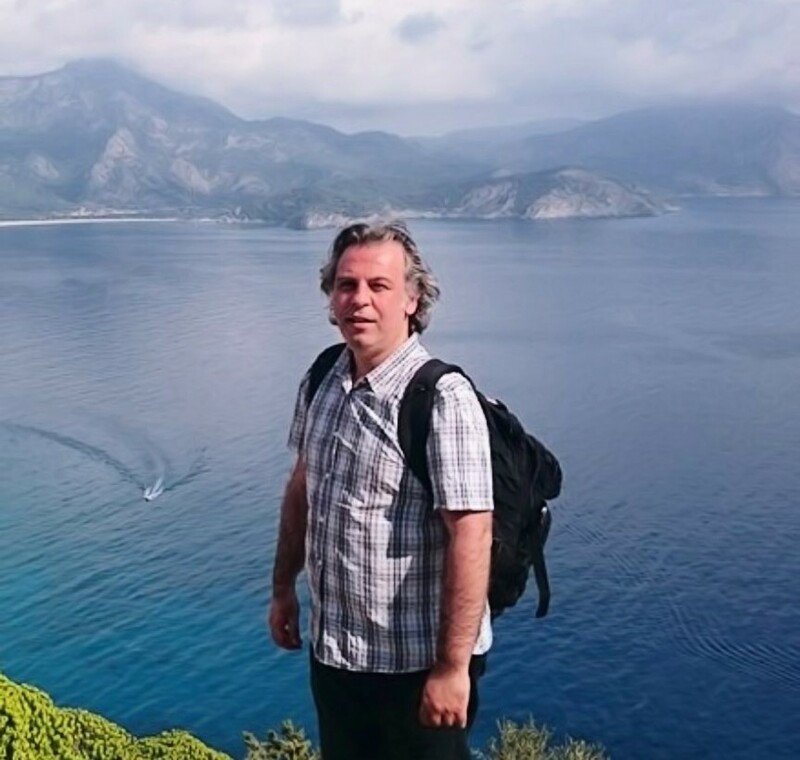 I have been living in Fethiye for 3 years. Contact me by email at aliakpinar@hotmail.com, by Facebook at Ali Akpinar on Facebook or by Skype at dem.turkish.center if you are interested in Turkish speaking courses & classes and would like to meet me online by Skype for a coffee to get to know each other and/or if you have further questions. Read the frequently asked questions about DTC Turkish Speaking Practice Classes and contact us b7 email at info@demturkishcenter.com or aliakpinar@hotmail.com to discuss the details and schedule your first Turkish lesson of your Turkish course. Can I try a lesson? TRIAL LESSON I am offering a trial lesson for Turkish courses. However we can have a short conversation in Turkish before your Turkish speaking classes to have an idea about your knowledge of Turkish and the way I am teaching. Contact me by email at info@demturkishcenter.com or aliakpinar@hotmail.com to schedule a trial lesson online. What software are you using for online lessons? SOFTWARE I am using Skype for my online Turkish courses & classes. Skype is a free software you can chat, talk (with or without video) over the Internet. If you don’t have Skype installed on your computer, simply download Skype at Skype.com and open an account. How many students are you teaching? NUMBER OF STUDENTS I am teaching one student privately. Although I tried to teach online classes to more students before, I am not teaching more students any more because it doesn’t work well due to connection speed and other technical problems. NUMBER OF WEEKLY HOURS The number of weekly hours are negotiable. I recommend you to take at least 2 hours a week. MATERIALS Although we are not using materials in Turkish Speaking Practice Classes, your teacher will give you some worksheets for some topics & dialogues to study in class or after class as homework. Plus your teacher will provide you with extra materials when you have a problem with a specific point that you need to improve. What days and times are you working? WORKING DAYS & TIMES I am working on week days (Mondays, Tuesdays, Wednesdays, Thursdays and Fridays) between 09.00 AM and 17.00 (or 18.00) Turkey time and Saturdays between 09.00 and 14.00 Turkey time. PAYMENT METHOD Since June 2016, Paypal.com hasn’t been operating in Turkey for sending and receiving money online. So I accept payments with Transferwise.com for online payments. I am sharing my account details with my students and they are sending me tutoring fee online with Transferwise.com, which is cheaper and faster than most online payment processors. Although I am flexible, I have my own terms & conditions for my online Turkish courses & classes. Please read and accept the following terms & conditions before taking online Turkish courses. Thanks in advance! My online Turkish lessons take 60 minutes. Minimum age of enrolment for my Turkish lessons is 18. The lessons are booked at least 1 day before the lesson. Booked (and paid) lessons are completed within 2 months from the payment date. Expired lessons are considered as completed, unless it is the teacher who is responsible for the delay of the lesson. The student pays for the tutoring fee before the classes using one of the payment methods above. The lessons missed by the student without a notice is considered as completed. The teacher waits for 15 minutes if the student doesn’t turn up at class on time. In case of being late, the lesson will be given and finish on time. Any notice of cancellation must be made at least 1 day before the class. Missed lessons are scheduled at a later date by the teacher and the student. Unfortunately any lessons cancelled without a notice will be considered as completed. Download Turkish language learning books, audiobooks and lessons for self-study (with/without audios)!